Asia Pacific, 2015-4-22 — /Travel PR News/ — Marriott International, Inc. (NASDAQ: MAR) today announced its Asia Pacific (APAC) operation has won a series of prestigious workplace awards within the first four months in 2015, including being named 2015 China Top Employer by Top Employers Institute, one of the Best Workplaces in Asia by Great Place to Workâ and the two Regional Best Employer Awards by Aon Hewitt for Marriott International and The Ritz-Carlton Hotels and Resorts, Asia Pacific respectively. These four major accolades combined with 15 Aon Hewittworkplace excellence awards for Marriott International in nine Asia Pacific markets – China, Hong Kong, India, Indonesia, Japan, Korea, Malaysia, Singapore and Thailand, recognize the company’s efforts to encourage, train and retain its 46,700 strong workforce, known as ‘associates’, across the region. The company’s focus on hiring locally, developing local talent and providing career opportunities is reflected in the Marriott International and The Ritz-Carlton Hotels and Resorts 2014 employee satisfaction survey for the Asia Pacific region which showed a 93 and 95 percent approval rating, respectively. Regan Taikitsadaporn, Chief Human Resources Officer, Asia Pacific for Marriott International said the company is dedicated to its associates’ professional development and personal wellbeing. “Making associates our focal point is not only good for customers but also makes good business sense and we will continue enhancing our suite of talent programs so as to attract, develop and retain the best caliber of associates,” Mr. Taikitsadaporn said. Associates each take part in average 34 hours of training and 78 hours of professional development for managers in 2014 and all associates in the APAC region attend a daily pre-shift meeting to discuss one aspect of the company or service values, followed by a brief 15 minute training session to reinforce a skill or area of knowledge. The meeting is also used for recognition of successful service or career stories. Hotels host a variety of town hall meetings, or “rap” sessions with the general managers and participate in community service activities to create a sense of pride and engagement with the company. The company is committed to identifying, training and supporting associates and it sets up clear career paths to help develop future Marriott leaders. Other initiatives include its Voyage Program for university graduates to fast track into a supervisory or entry management positions, and Core Management Leadership Programs consisting of over 10 facilitator lead courses, online curriculum and self-paced programs. As of December 2014, 64 percent of management positions in the APAC region were filled internally. In addition, Marriott International is aware of the powerful roles that women play. Since its inception in 1999, The Women’s Leadership Development Initiative is set to formalize a comprehensive women’s agenda at Marriott. Its objectives include increasing the presence of women in the highest level of management and in other key decision-making positions, improving the career development process at Marriott, developing a role for senior management to play in ensuring that women progress, and capitalizing on the supply of women leaders currently available to drive the success of the organization. At the 2014 “Women in Leadership” Asia Pacific Conference, more than 75 Marriott female executives from across Asia Pacific met in Shanghai to network, share their career success insights and learn about growth and development opportunities throughout the region. To date, twelve percent of the General Managers in Asia are female. The company uses social media to seek out potential new associates using eight different languages. It attracted more than 1.2 million global fans on the Marriott career Facebook site with about one-third are from the Asia Pacific region. Those interested in becoming associates can also access job information on the recently launched MarriottCareers on Twitter, which attracted 50,000 followers in its first month. They can also use a mobile app, LinkedIn and in China, Weibo and WeChat to stay connected with Marriott International and learn about career opportunities. Developing talent is crucial to present and future success as Marriott International expands across the region. Marriott International expects to create approximately 37,000 new jobs in Asia through its continued growth and development in the APAC region in the next three years and it plans to increase its workforce to more than 40,300 in China alone by 2017. 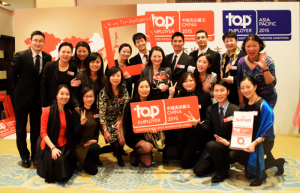 In January, for the fourth consecutive year, Marriott International was acknowledged as China Top Employer by Top Employers Institute and also named as one of the Best Workplaces in Asia by Great Place to Workâ. Marriott International, Inc. (NASDAQ: MAR) is a global leading lodging company based in Bethesda, Maryland, USA, with more than 4,100 properties in 79 countries and territories. Marriott International reported revenues of nearly $14 billion in fiscal year 2014. The company operates and franchises hotels and licenses vacation ownership resorts under 19 brands. For more information or reservations, please visit our website at www.marriott.com, and for the latest company news, visit www.marriottnewscenter.com. This entry was posted in Business, Hospitality, Hotels, Travel Awards, Travel Human Resources, Travel Management, Travel Services and tagged Asia-Pacific region, Marriott International, workplace excellence awards. Bookmark the permalink.